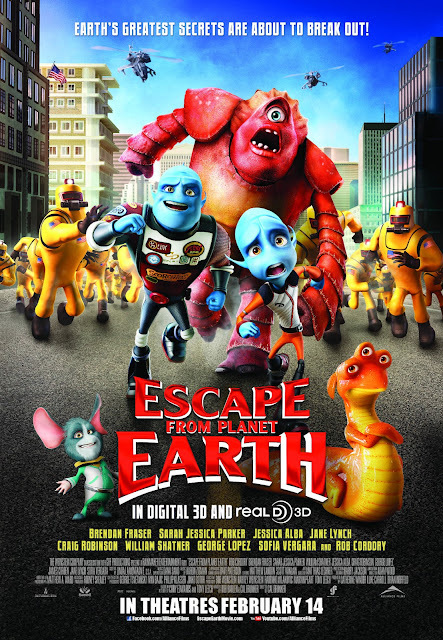 Escape From Planet Earth: Win Tickets to the Advance Screening! This February, Escape From Planet Earth will hit the big screen to bring you an action-packed movie that's out of this world. This animated film follows the story of alien astronaut Scorch Supernova, revered as a national hero on planet Baab. Scorch works alongside his brother Gary, head of mission control at BASA, to do everything in their power to protect their galaxy. When BASA’s chief Lena informs them about an SOS sent from the dark planet Earth, Scorch embarks on a new mission only to find himself trapped by the evil Shanker. Gary is left to rescue his brother as well as his planet, his wife Kira and their son Kip. Escape From Planet Earth boasts a star-studded cast that includes Brendan Fraser, Sarah Jessica Parker, George Lopez, Jessica Alba, Jane Lynch, Paul Reubens, and William Shatner, who apparently can't get enough of space, the final frontier. On Saturday, February 9, Toronto will host an advance screening of Escape From Planet Earth and, thanks to eOne Films, three lucky families will win a pass for four to enjoy the movie before it opens in theatres on Valentine's Day. The screening will be held at 10:00 AM at Cineplex Yonge and Dundas. For a chance to win 1 of 3 family passes to the advance screening of Escape From Planet Earth in Toronto, please complete the Giveaway Tools form below. I would take my daughter to this movie! I'd take my two daughters and my hubby. Looks like a really fun movie! My gf likes movies like this. I would take my son, my sister, and my niece! Oh, and I just realized it was for Toronto only! I'm in Vancouver, so disregard my entries.. silly me, serves me right for not reading the fine print ;) Good luck to the winner! Thanks for stopping by anyway, Dayna! I would take my uncle with kids! Oooh I would take my 2 boys and a friend!! I would like to take Alex! My 7 year old daughter and I would go with my best friend and her daughter. The girls are best friends too. This would be a wonderful escape for all of us! I would take my dad! I would take my 3 daughters! It'll be a family outing...my 7 year old daughter, 11 year old daughter, me and my hubby! I would love to take my boys.